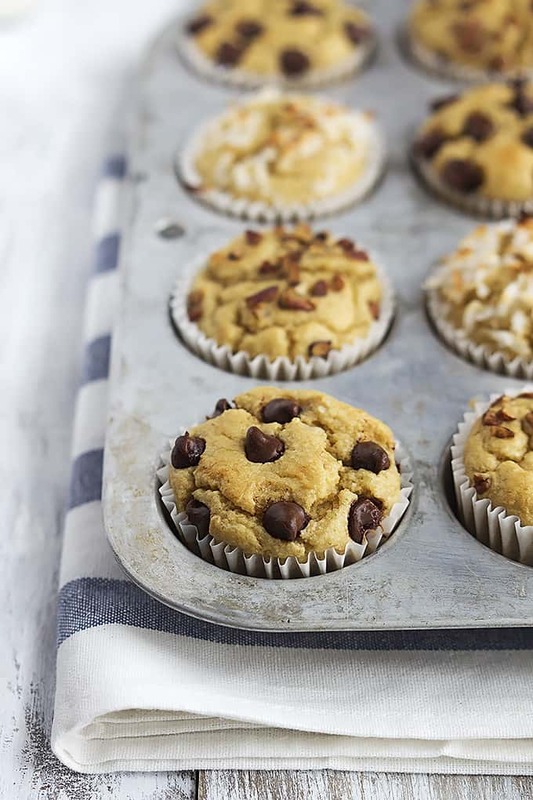 Moist and fluffy Flourless Banana Blender Muffins! 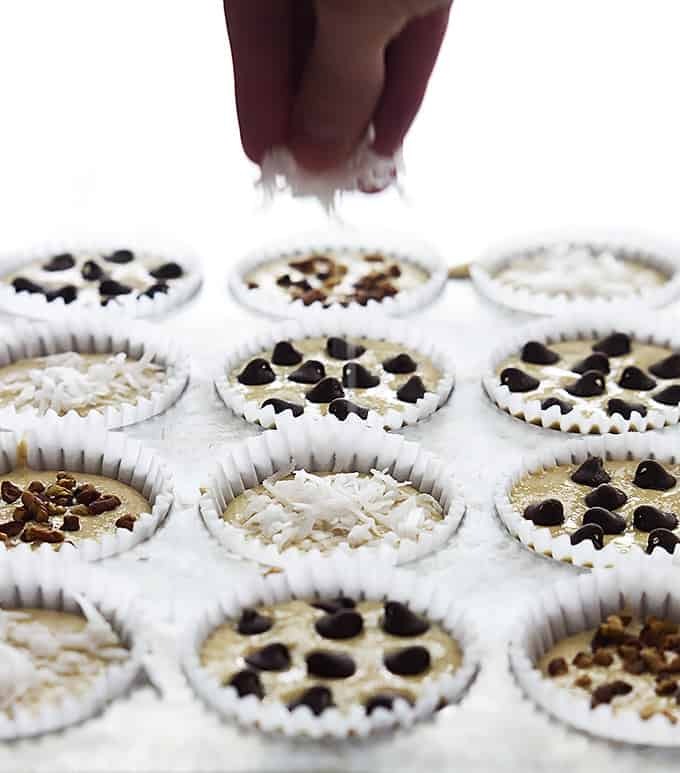 They are SO easy to whip up in your blender and you can add all of your favorite mix-ins like nuts, coconut flakes, cinnamon, or chocolate chips! Hollaaaaaa for easy breakfast ideas. I love breakfast food, I do, but the morning always seems to get away from me and by the time 10am rolls around I’m famished and need something like, yesterday. Enter easy grab-n-go breakfast option. I love blender-made anything. 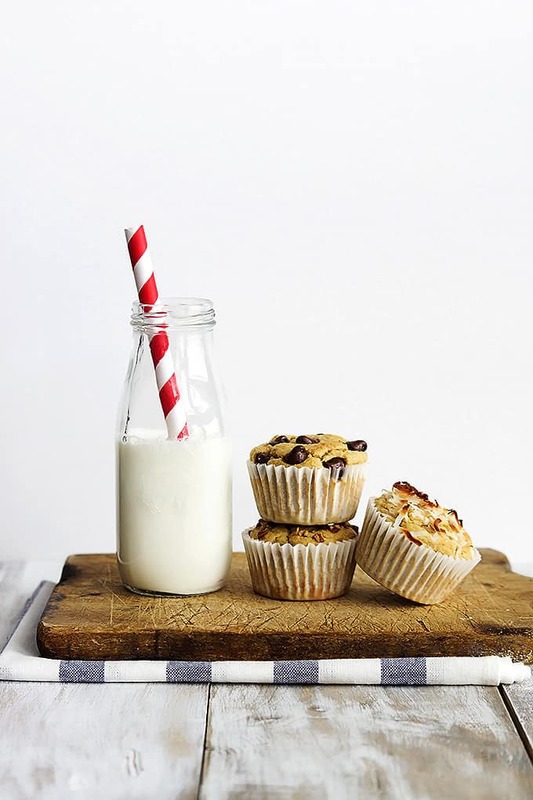 Smoothies, soups, you name it, but especially muffins. No need to dirty a bunch of bowls and whisks and hand mixers and blah blah – just throw it all in the blender, pulse, and pour. 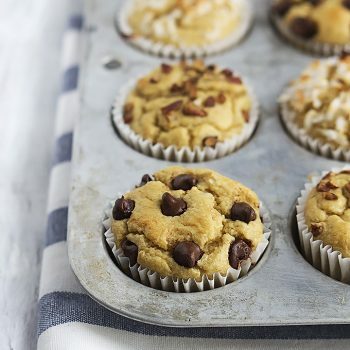 The fun thing about these easy flourless banana blender muffins?? The MIX-INS! It’s like ice cream. How can you not go crazy when you’re faced with a dozen options of yummy add-ons to your giant bowl of ice cream? You can’t. Crazy will happen. And that’s sort of what went on here when I was trying to decide what to add to my blender muffins. Chocolate chips?? Coconut?? Cinnamon?? Nuts??? 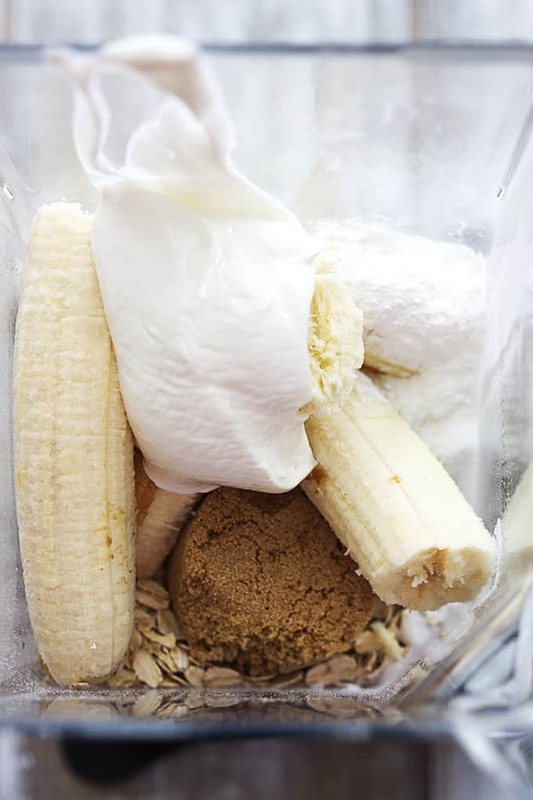 ingredient in the blender pictured with this recipe? 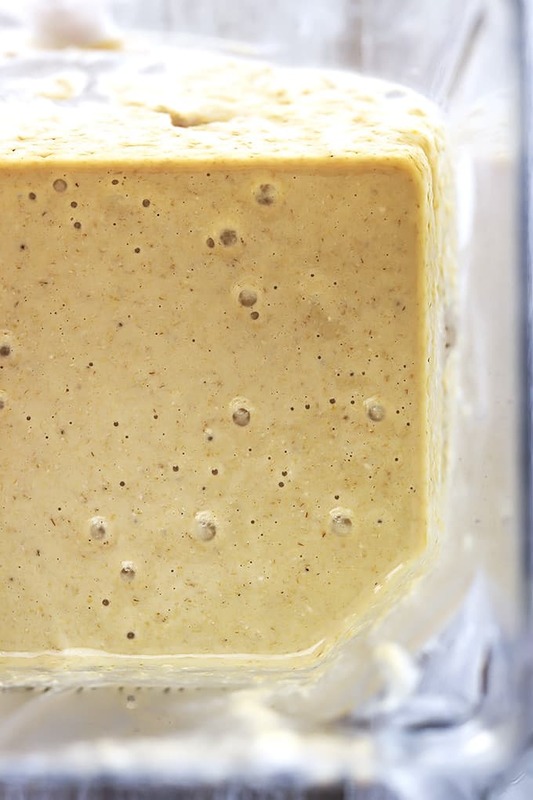 Have you tried mixing with a regular blender? opening page. This is getting so rare. So thank you. mine turned out great. sour cream or yogurt – doesn’t show where to add in the instructions, when i printed had to write it in. someone unknowingly might not include and will be unhappy with the recipe. thank you for your time. These not only look super delicious but so easy! I can’t believe there’s no flour in these. And yes, the mix-ins!! I’ll take all of them, too! Love this idea! Oh yes. I need to try these. They look SO good and SO easy, and I could go craaaazy with the mix-ins! Gorgeous pictures too! Do the oats get crushed up? Or are there flakes of oats in the muffins? I did make these is a normal blender and they turned out great! The only suggestion I have is to NOT use cupcake liners as a lot stuck to the paper and I lost a good part of my delicious muffin! WoW!! This muffins is look i feel so hungry. Sorry I don’t see when you add the banana or the sour cream/Greek yogurt. Do you add everything at once and blend? This looks delicious! I only have quick cook oats with flaxseed or steel-cut oats. Do you think one of those would work since you blend the recipe or would the texture be way off? Thanks! These look delicious!! I’m wondering if I could substitute the brown sugar for applesauce, or would that be too much liquid? I’m trying to find the ultimate healthy muffin! These came out perfect! Glad I found this recipe! Could you do chopped walnuts as an add in? Could this be baked into a loaf pan instead of muffins? Hi Lupita! I haven’t tried it myself but it’s worth a shot! Definitely would need to increase the baking time but I’m not sure by how much. And careful not to over-fill the pan! Let me know if you give it a try, would love to know how it turns out! Would it be okay to sub the sour cream/greek yogurt with silken tofu? Trying to increase the protein content. Thank you. P.S. Muffins look amazing! And an absolutely easy recipe! H! I would love to do this unfortunately though, my oven is currently broken. Can I use oven toaster for an alternative? Hi Jessica, Dang that’s terrible to have a broken oven!! Ah how frustrating! 🙁 Unfortunately, I don’t have any experience baking in toaster ovens so I couldn’t say for sure! Wow! I was just looking for a relatively healthy option that would be quick to fix as a special treat for my 3 year old daughter. These were soooo easy and absolutely delicious. We both loved them! Your recipe made 15 muffins for us, so even though we gobbled down 2 each, we’ll get to enjoy them again for several days. Thanks so much for the recipe! These were most definitely the best flourless muffins I’ve ever made. I was skeptical of trying them because every oat based muffin I’ve tried has been dry, but these are awesome. I just used quick oats that were in the cupboard and a food processor and it worked great. Hi – I’m from England and have never used a ‘cup’ to measure ingredients. Do you just use a mug? Thanks! These muffins are the absolute best. I love that they are Gluten Free, even though I don’t really need them to be, but the flavor. OMG, So good. So moist, Kind of loaf like textured. The only thing I changed a bit, but didn’t even know I had, was the chocolate chips. I thought it was only 1/2 c. so I’ve been 1/2c, of the MINI chocolate chips vs normal chips. There is so much chocolate in these because of the mini’s. Perfection. You all gotta make these. I have a Vitamix and its perfect for these. Thanks for the great pictures. Great recipe! I’m always looking for a recipe that is lower carb, lower sugar because of hypoglycemia. These were perfect! I actually forgot the sugar – I was going to use Stevia but forgot, although I did sprinkle a few chocolate chips in the batter. When they came out I topped it off with a little butter and peanut butter and wow!! I didn’t even notice the lack of sugar. This is definitely a keeper. Thanks! I can’t wait to try it! Thank you. Will this recipe work with steel cut oats? I have no old fashioned oats in the house. Any alternatives suggested? Hi Jessica – I’ve never substituted steel cut oats in a recipe. I did find some information that says to substitute the same amount of steel cut oats but to increase the cooking time by 10-15 minutes to soften the oats but to check on them often to make sure the baked goods don’t burn. Let me know how it goes! Can I use applesauce instead of yogurt/sour cream? I assume sour cream goes in with the rest of the ingredients? Yes, thanks for pointing out that error! 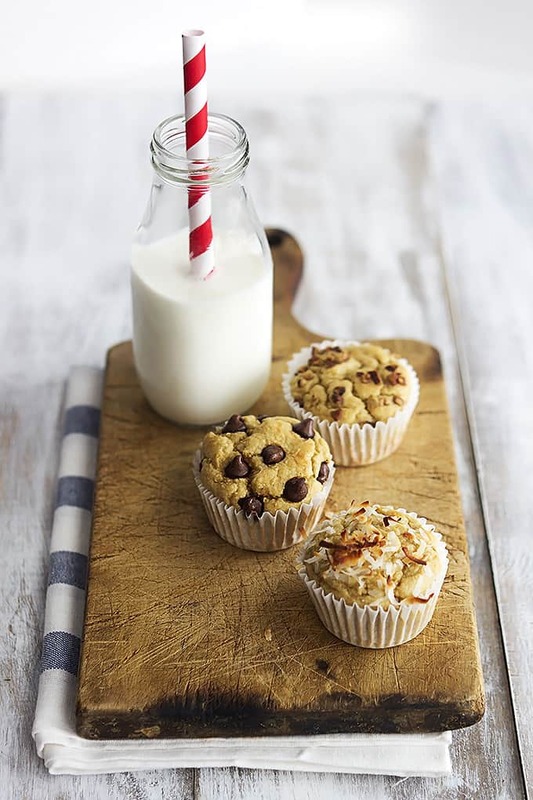 These are delicious muffins! I love being able to throw everything in the blender and VOILA-ready to bake. I made these this morning AND substituted pumpkin puree for the Greek yogurt, coconut sugar for the brown sugar,ANd aDDED PUMPKIN pie seasoning,CINNAMON,and a shredded carrot for some hidden veggies for the kiddos. I will definitely make these muffins again. Shannon- sounds like you knocked these ones out of the park! Way to sneak in some hidden veggies! 😉 My kind of person, haha. Thanks for your feedback! Glad that they turned out great for you!